Air Conditioning is fast becoming the new normal in the great Northwest. Last month we looked at the reasons for AC’s increasing popularity, including long term changes in weather. Another reason that air conditioning systems are getting a green light from consumers is because of their improved energy efficiency. In part two of our series on AC, Fox Plumbing & Heating looks at ductless heat pumps – the most versatile and energy efficient cooling option. The way a heat pump works is by taking heat from one place and transferring it to another location. It heats efficiently because no fossil fuel is used to create that heat, the equipment just pulls it from the outside air. The same process in reverse cools your house in summer. It works a bit like your refrigerator. The heat pump pulls the heat from inside your house and sends it back outside, keeping your home comfortable. Ductless mini-split systems can be used in homes without ducts, and contrary to the name, can also be installed in ducted homes. There are two main components to what is known as a mini-split system, the indoor unit(s) and the outdoor unit. The indoor unit, also called a head, typically sits on the wall about 6 inches below the ceiling. The outdoor unit, which is smaller than a central air unit, sits on the ground, deck, roof or patio outside. One outdoor unit can support up to four indoor heads. Fox Plumbing & Heating’s HVAC specialists are fully trained and can help to answer any questions you have about these min-split systems. Ductless heat pump indoor units are whisper quiet. They are significantly quieter than window AC’s and quieter than air going through central air vents. The exterior units are also remarkably quiet. They are within noise ordinance requirements for Seattle and surrounding communities. For electrically heated homes with no ducts, ductless heat pumps are the most efficient whole home option for both heating and cooling. They deliver savings of 25-40% vs baseboard electric heating. In addition, Energy.gov notes that choosing an efficient cooling system can save 20-50% of your cooling energy use too. While most ductless products are efficient, Fox’s HVAC technicians recommend Daikin ductless products because of their energy conserving features. Daikin’s inverter technology runs the heat pump efficiently, modulating power use like cruise control on a car. Daikin models also have econo and standby modes which further manage power consumption to keep energy costs low. The indoor wall mounted units operate via a remote control. With some models, you can select different temperatures in each room, as long as all indoor components are set to cooling. One of the aspects of ductless cooling that our customers love is the ability to design a system that fits their needs. You can cool just one space, two spaces or a whole house by putting together the components. 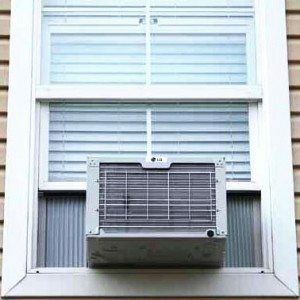 There is no need for a window to put the AC in your home. Ductless splits can be installed in any room with an exterior wall including garages, barns, cabins, workshops, bonus rooms and basements. The basic system of one indoor unit and one outdoor unit can cool up to 1000-1400 sq ft. Your local Fox HVAC technician specialist will work with you to build your system and size it correctly to deliver the heating and cooling you need. While ductless systems are a great choice for electrically heated (ductless) homes, they can also be a good fit for ducted homes and freestanding additions. To maximize the energy efficiency benefits and get year round comfort you should choose a system with both heating and cooling capability. This true customer story is typical of older homes, for example those in Ballard, Queen Anne and West Seattle, where Craftsman houses have been modified over the last hundred years. Debra’s 1926 house has ductwork, and she has central heating with natural gas. Sometime in the past, a piece of the upstairs master bedroom was sectioned off to create a separate bathroom. The only duct in that original room is now in the new bathroom. Since heat rises, this left her trying to sleep in an unbearably hot bedroom all summer long. Without any ducts, adding a central air conditioner would not solve the problem. She tried a window AC but the blasting fan would make the room too cold in the morning. The unit was noisy and leaked water. In addition, her summer power bills ballooned. By installing a ductless heat pump in the bedroom, she is now able to set the temperature and fan speed so she can sleep comfortably. It also cools her adjacent office and bathroom. Her summer electric bills are about 40% lower than when she had the window AC. Fox installs and services ductless split systems and central air conditioning systems. To find the right cooling system for your home, or for more information about energy efficient ductless min-split air conditioning units contact a Fox HVAC technician specialist.